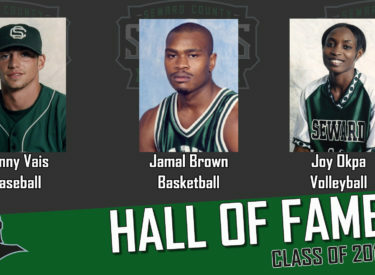 LIBERAL, Kan. – Seward County Director of Athletics Mike Davidson has announced that Seward County will welcome three new members to the Hall of Fame this year after Jamal Brown, Danny Vais and Joy Okpa each received enough votes to be inducted. Celebrating the 8th induction ceremony, this year’s class of 2019 brings the current roster of Hall of Fame inductees to 21 members and one team. Brown becomes the fourth men’s basketball player to enter the Hall, joining Tony Slaughter, Kevin Houston and Carlo Walton. Brown is the all-time leading rebounder in school history with 775 and is fifth on the all-time scoring list with 1,227 career points. He averaged 18.9 points and 11.9 rebounds throughout his Seward County career, making him the only player in school history to average a double-double. He was a 1st Team All-Conference selection as a freshman in 1999 and was named the Jayhawk West Most Valuable Player and a 1st Team All-American as a sophomore when he racked up 706 points and a school record 470 rebounds. Danny Vais makes it back-to-back years for a former baseball player to make the Hall of Fame, becoming the fifth member of the Saints baseball program to be inducted. He joins Galen McSpadden, Cory Patton, Tim Forkner and Kelby Tomlinson. Vais was at the forefront of two Jayhawk West Championships for Seward, anchoring the Saints pitching staff as their #1 starter. He is the school’s all-time leader in wins with 21 and innings pitched with 215, is second in strikeouts with 220, and is third all-time with a 2.80 career ERA. As a freshman he set school records for innings pitched and strikeouts while notching the second most wins in school history before being named an Honorable Mention All-American and the Jayhawk West Freshman of the Year. As a sophomore he was just as good. He finished second to himself in single season innings pitched and strikeouts while being named the Jayhawk West Most Valuable Player and leading the Saints to their first ever NJCAA World Series appearance. Joy Okpa will be the final inductee. After receiving enough votes a year ago, she has elected to be inducted into the 2019 class. Okpa becomes the first volleyball player to gain the prestigious honors and the second member of the Lady Saints volleyball program, joining coach Pat Stangle. Okpa is the only two-time NJCAA All-American in Seward County Volleyball history. She led the Lady Saints to a pair of NJCAA National Tournament appearances, combining for a 75-17 record in her two seasons in Liberal. Okpa was a 1st Team All-Jayhawk West selection in both of her seasons with the Lady Saints and as a sophomore was named to the NJCAA National Tournament All-Tournament Team. The trio will take their place in Seward County history on April 19th during the Hall of Fame Banquet in the Greenhouse.